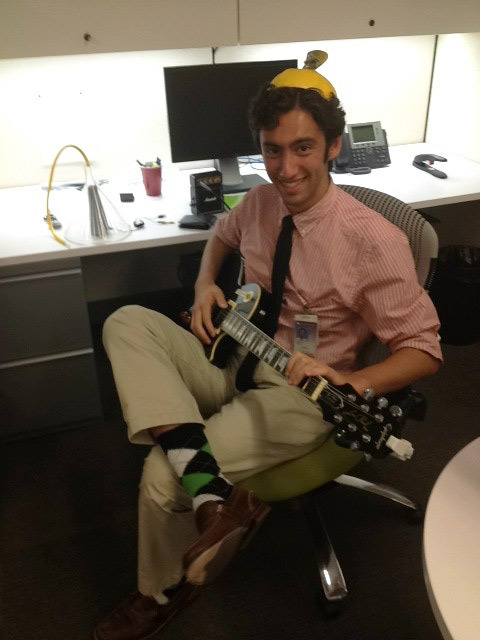 Joel Pelovitz spent the summer of 2012 as a Lemelson Center intern. He is currently a senior at Muhlenberg College. It is hard to believe that the summer has already come and gone right before my eyes. Over the last two months, I have had the pleasure of interning with the Jerome and Dorothy Lemelson Center, located within the Smithsonian’s National Museum of American History. The primary concern of the center itself is the conveyance of information regarding innovation and invention, while also sharing the story of inventor and co-founder Jerome Lemelson. As I stepped onto a busy metro car on June 4th (my first day), I was not sure what to expect upon my arrival. As this was my first professional experience within a museum, I was not entirely aware of what my role would be or what impact it would have. On top of it all, I was scheduled to start right after my orientation. Talk about jumping right in! Aspiring curator, inventor and guitarist at work. Lemelson Center photo. Once I had attended a brief yet informative orientation, I made my way to the Lemelson office located on the first floor of the museum. No sooner had I walked through the door then was I greeted by a team of friendly and accommodating co-workers. It was immediately apparent to me that the office space was a direct reflection of what the Lemelson Center stands for, that is it was an ideal representation of innovative and collaborative qualities at work. It is no wonder that all of my best ideas and contributions have taken place in this very office, amongst this dedicated group of individuals. What’s more, I found it gratifying that my ideas were given due consideration. I felt especially privileged by this because it showed me that the team really wanted me to feel and be treated as a professional. It was not long before I started work on the Places of Invention project. POI, for short, is an exhibit set to debut in 2015, which will incorporate six different case studies. Each case study is representative of a time and place, either past or present, in which invention and creativity were prevalent. The objective of the exhibition is to instill in the minds of visitors that place matters in terms of invention and that individuals, in accordance with their communities, are usually responsible for technological breakthroughs. When I was brought on as a researcher, I knew I would be assisting in the collection of information, yet I never could have guessed how much more involved I was going to be in other aspects of the center/exhibition. Not only was I reading through certain texts indicated by the curators, but I was actually making important connections within the readings, for which the curators expressed appreciation. I was also, on multiple occasions, able to locate new textual and visual media representations. I was glad that the information I provided was useful to the curators. Working alongside them really opened my eyes to thinking about invention in new ways, from Albert Pope and Samuel Colt in Hartford to Grandmaster Flash and DJ Kool Herc in the Bronx. After only a week of being there I was able to attend the POI Affiliates Project Workshop at which representatives from all museums involved in the project were present. I participated in two of the floor design meetings with Roto (the exhibition design firm hired on to build the space) and contributed three different potential interactive ideas. I could literally see the design phase progressing and materializing before me! One of the interactive ideas that I designed was a simplified version of a talk box. What a talk box does is channel sound frequencies from an electronic source such as a musical keyboard, guitar amplifier, or a computer into a tube which is then placed in the user’s mouth. The mouth then acts as an acoustic prism, which by changing its shape effectively achieves sound modulation by manipulating wavelengths. What this means in English is that by connecting a sealed-off apparatus equipped with a tube to the top of a speaker, it leaves nowhere for the sound to exit but through the tube. One then simulates forming words with their mouth and the speaker talks! I was personally able to prototype a working model in the office with Steve Madewell (the Interpretive Exhibits Coordinator), who expressed great interest in potentially using it for the center’s acclaimed Spark!Lab. The Spark!Lab is a hands-on workshop where children can put their creativity to work in designing their own inventions. The experience I had while interning at the Smithsonian was better than I ever could have imagined. As museum curation has been a strong consideration of mine for a career path, my time here has given me true insight into the behind the scenes operations within a museum setting. It has perfectly aligned my interests in both history and technology. My father is an engineer and I had also considered engineering in the past. My father’s work connected him with long-time family friend and business associate, Ralph Baer, inventor of the original “Brown Box” videogame console, the Simon light game and other commercial products. Having been raised in such a creative environment — in which even my childhood toys could be inspiration to Ralph and my father — I developed a fascination with technology. Memories of my childhood exposure to their collaboration have resurfaced and in working with the Lemelson team I have only reinvigorated that fascination. Thank you to all in the Lemelson office for making me feel like a true member of the team!